Like most things in the world of parenting, allowance is something that can be polarizing. There is a wide spectrum of what people’s thoughts and policies are on allowance. “I give an allowance so my child will learn how to manage money” proclaim some. “I am not paying my child for doing things he should be doing anyway!” proclaim others. There are a whole lot of ways to approach money with your children. I think of allowance a lot like I think of potty training–this really isn’t a moral issue. There are many options. There isn’t one right way that would work for all families. You might even do many different methods over the years. You might like one method for one child and another method for another child. Teach your child about money. In my mind, the point of an allowance is for your child to learn about money. Your child needs some concept of the worth of money. How long does it take to save up for something? How much do things cost? How much time and/or work took to save up that money? Is the item worth the money it would take to get it? Once your child has the item, your child will better appreciate the item and take better care of it. Your child needs experience in managing needs vs. wants. Your child needs to understand what happens when your money reaches 0. That means no bailouts. Your child needs to learn to pay tithing (if that is something you do). You can’t gain a testimony of tithing without actually paying it. Your child can also learn to be generous with his/her money. 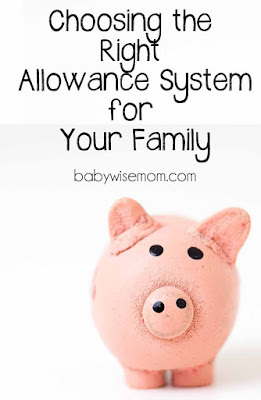 Even if you are in the no allowance camp, you need to be sure your child learns how to handle money, which means you need to make sure your child has money to manage in life. I believe teaching children money management is a fundamental job as a parent. 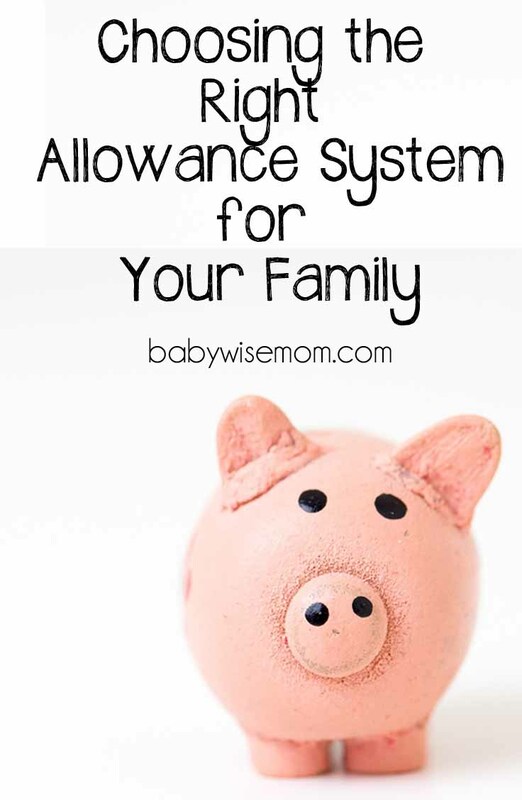 Here are some common systems people use for allowance with their children. Every one of these methods I will describe will have proponents and opponents. Each side will have compelling arguments. You have to choose what you think is best for your family right now. Always remember you can change things as needed. Choosing a method isn’t a lifetime commitment. Some parents pay their children so much money for doing chores. They might pay per chore or they might pay a base rate if chores get done. The pro here is that your child has reason to do chores, which should lead to less reminding from you. The con here is that children will potentially either choose no allowance to avoid a chore or or they will expect to get paid for everything they do. Opponents also point out children should help around the house simply because they are part of the family and should be contributing to the function of it. Some people pay their children so much money per week or month with no dependency upon the chores done in the home. Proponents of this idea state that teaching children about money is a fundamental job of parenthood. Because you are teaching about money, the money shouldn’t be tied to anything else. The opponents of this idea point out that children can become entitled and think they “deserve” the money even though nothing was done to earn it. While you are teaching about handling money, you aren’t teaching what it means to earn money. This is probably my favorite method. I first read about this in (affiliate link) Making Children Mind Without Losing Yours by Kevin Leman. I love it because it is a way to achieve all goals of teaching children to work and to manage money. You don’t have to pay your child for the chores they do. They want a child to do chores just because they are a member of the family. I totally agree with that. Other people like to pay for chores because it gives children incentive to get chores done. Leman’s idea is perfect because if your child doesn’t do his or her chores, he has to pay the person who did do the chores. So the child still gets the money, but the money goes bye-bye if chores don’t get done. It is very real-world. As a parent, I have seen this isn’t a flawless system, however. Kaitlyn really dislikes chores. She was perfectly content to pay her siblings to do her chores for her. She didn’t mind having no money if it meant no chores. I believe a job of mine as a mother is to teach my children how to work, so I put a stop to her business venture. That idea works in the real world, but she wasn’t actually earning the money in the first place, so I wasn’t going to allow her to use her unearned money to get out of chores. For more on this method, see Making Children Mind…Chores and Allowance. This is the method we are currently using at our house. It is really where we just naturally fell as a family. Our kids have basic chores they are in charge of. If they want to earn money, I have other chores they can do to earn some. I use deep cleaning jobs for this–things like cleaning baseboards, cleaning blinds, washing walls and doors…things that don’t need to be done weekly. Some people don’t like the idea of paying for extra chores because they say kids will only choose the chores they like. They say this isn’t realistic to life. They want their children to do extra chores without money and without having a voice in which they do. 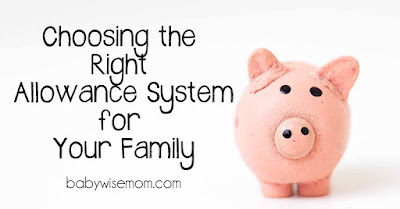 Proponents of this method like that you can have your normal chores, you don’t have to mess with allowance, and your child still has the opportunity to earn money. Money has to be earned and is not given to them, which is more like real life. I don’t know if anyone would argue this one. The point here is that there is an age to start allowance and teaching about money. The “right” age can be debated. I would say no later than 5 or 6. Age 4 is probably the earliest you need to do it, but if you have a 3 year old who wants to be like the older siblings, it isn’t going to hurt things. We have really done all four of these methods at different times except for number one. I loved method three for helping getting the kids interested in money. We gave a dollar a week per child. Not a lot. They could still do extra work to earn money. That way they had a cash flow and could use that money to buy things they wanted. It gave them incentive to do chores so they could keep their money (except for Kaitlyn…). It helped them to have money to learn to manage. Like I said, we are talking about allowance so we can fulfill a responsibility as a parent to teach our children about money. No matter which system you choose, you want to be sure you are teaching basic money skills. What should we be teaching? Require your child to save some money. Do not allow your child to just spend 100% of the money earned. That might sound harsh–no one is telling you how much to save! But you aren’t a child. No one is telling you to wear a jacket or to wash your hands after you use the bathroom, either. Remember, this money is for you to teach your child. Your child doesn’t get adult privileges as a child. Many people do a “give, save, spend” idea. We have (affiliate link) piggy banks that have “save, invest, spend, and donate.” 10% goes in save, 10% in invest, 10% in donate, and 70% in spend. Require your child to donate some money. Learning to be charitable is a valuable life lesson both for the individual and for our society. Allow your child to make dumb money decisions. But still advise your child. Let your child know the potential problems you see with the money decision (toy is poor quality? toy is not something your child will like long-term? toy cost more money than it is somewhere else?). Advise, but allow your child to make the decision (so long as the item falls in line morally with your family standards). Your child will make the dumb decision and will remember that lesson in the future. Leave your child wanting for things. If your child gets everything he ever wants, he doesn’t have much incentive to practice using this money he is getting. Do not pay your child too much. You want your child to have to work for the item he wants. It can’t all come to him from a few chores. He needs to learn to save for something. He needs to learn to wait for something. Brayden once spent two years saving for one item (it was a very bit ticket item). Help your child set goals. Having goals is what helps you learn to manage your money. Help your child think of what he or she wants to save for. Talk about how long that goal might take. Brayden knew his goal would take years when he took it on. Not all children (okay, very few) will have that much patience. He is my only child thus far to have that kind of financial patience. Having a goal will help your child to not just spend 100% of the spending money every time it gets above one dollar. As you are choosing your method, keep in mind this is a means to an end. The end goal is to teach your child all about money over the years so your child can leave the home ready to responsibly manage his or her own finances. We are raising future adults.